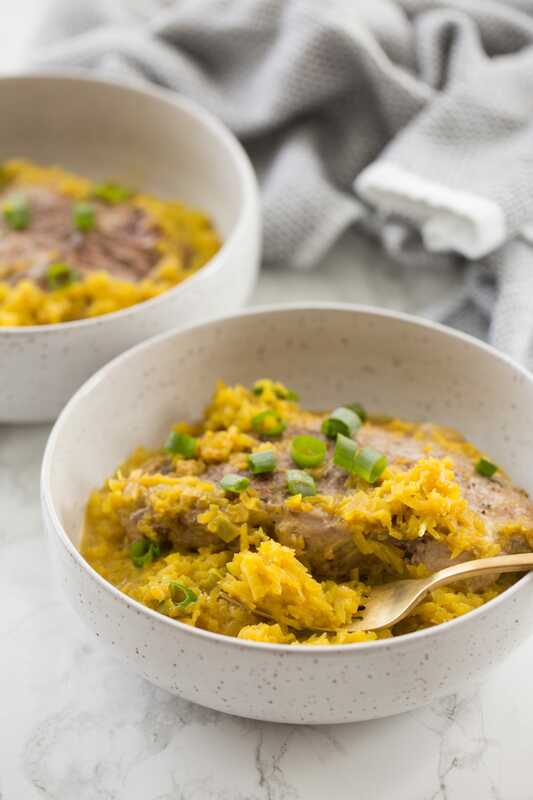 Golden beets are spiralized and then pulsed into rice in a food processor and then cooked with scallions, ginger, garlic and simmered in coconut milk for a creamy, risotto-like rice dish with juicy bone-in pork chops. Gluten-free, Paleo-friendly, and one pan! One of my favorite vegetables to rice is beet. Golden beets are great, because they’re less mess than red beets. Right now, there are plenty of beets at the farmer’s market, so take advantage of that and make some golden beet rice! If you’ve never tried making spiralized rice before, here’s a helpful post on that. 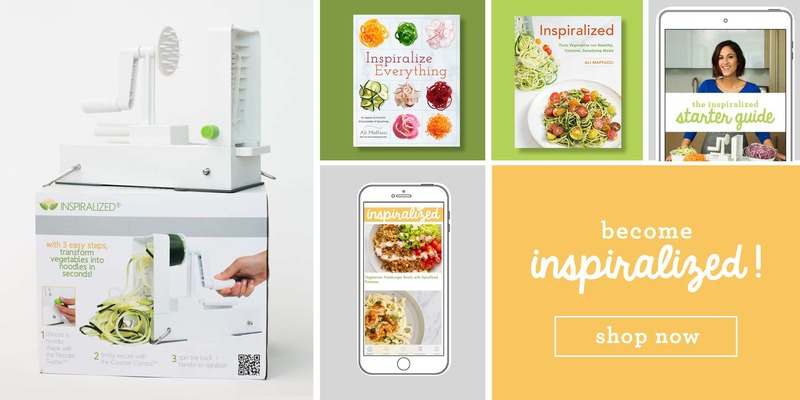 It may sound time intensive, but it’s not at all (you literally just spiralize and pack the noodles into a food processor to pulse them) – and once you start doing it, you’ll wish you were doing it all along! 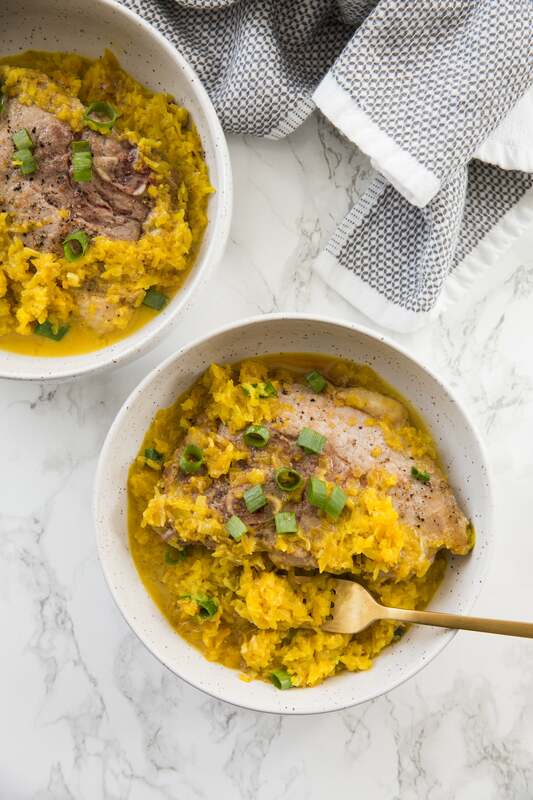 The golden beet rice is simmered in coconut milk, ginger, scallions, and garlic for a flavor that’s so good, you’ll want to cook everything like this! Seriously, though. The rice cooks in the broth, absorbs the flavor and becomes so amazingly creamy! 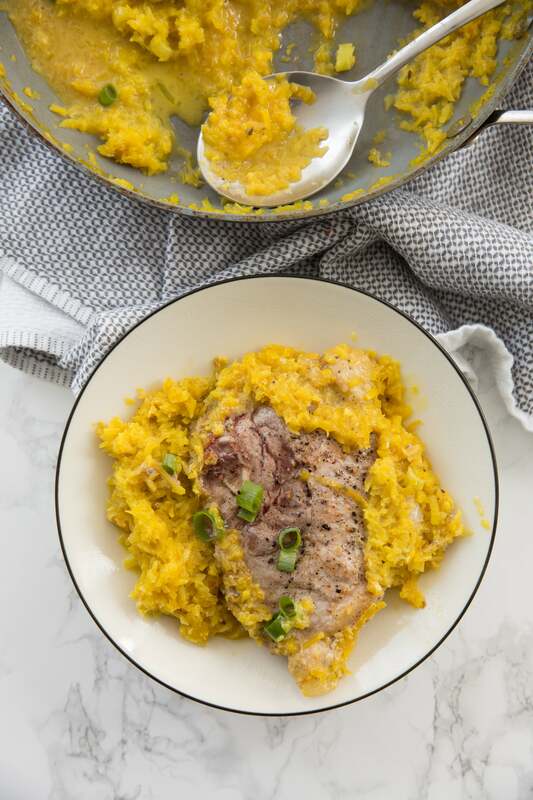 The pork chops are quickly seared in the skillet and then nestled into the rice and coconut milk mixture for the juiciest chops, ever! I made this recipe for two – feel free to divvy it up into bowls are just serve as is, straight out of the pan! And I know, I know – two meat recipes back to back, who am I?! More veggie-friendliness coming next week, but if you’d like to make a vegetarian version of this, use tofu! Cook the pork chops. Season generously with salt and pepper on both sides. Heat half of the oil in a cast-iron skillet over medium-high heat. Once oil is shimmering, add the pork chops and let cook for 3-4 minutes, flip over, cook another 3-4 minutes. While the pork chops cook, place the beet noodles into a food processor and pulse until rice-like. Set aside. Set the chops aside once they are done searing and immediately add in the scallions, ginger and garlic. Let cook for 2-3 minutes until soft and then add in the golden beet rice. Season with salt and pepper and cook for 5 minutes, stirring often. Add the coconut milk and soy sauce and stir well to combine. Nestle the pork chops back into the skillet, cover, and cook for 10 minutes until pork is light pink on the inside and rice mixture is creamy. Garnish with scallions and serve. This rice looks amazing! About what size pork chops did you use? I’m trying to calculate the calorie count for just the rice. Thank you! Hi Silpa! Let us know how it turns out!